Beauty Costs > How Much Does a Mink Coat Cost? A mink coat is made from the hide of a mink animal, a member of the weasel family. The cost of a mink coat will often depend on the quality of the coat, the brand, the size and the store selling it. On average, a mink coat can vary anywhere from $100 to as much as $10,000 for an authentic real full-length coat made by a major designer. Lower-end mink coats, often in the $100 range, tend to have a “mink look” but are not made from an actual mink hide. Like clothing, designer labels can have a large influence on the price. For a higher-quality brand that is quite popular, it is not uncommon to see a mink coat be more than $20,000. Dyed mink coats tend to be considered a lower quality coat, while a higher quality coat will not have the dye. On eBay, for example, there are thousands of listings ranging anywhere from $500 to $4,000. Most of the ads we looked at were for slightly used coats. eBay also had a guide saying that it will be very hard to find a mink coat of good quality for less than $3,000. The bulk of the market, according to this guide, will be in the $3,000 to $10,000 range. Forum members on vintagefashionguild.org discussed the prices of a mink coat. According to the forum thread, a mink stole, which would cost about $300 in the 1950s, would cost close to $3,000 today. A quality mink coat will have a pelt label on the interior of the coat, and this label will ensure you that the coat has met certain standards. Look for pelt labels assigned by organizations such as the North American Fur Association, the American Legend Mink Cooperative, or the Saga Furs of Scandinavia. Today, the most popular colors are black, followed by brown, dark brown, sable and blue iris. 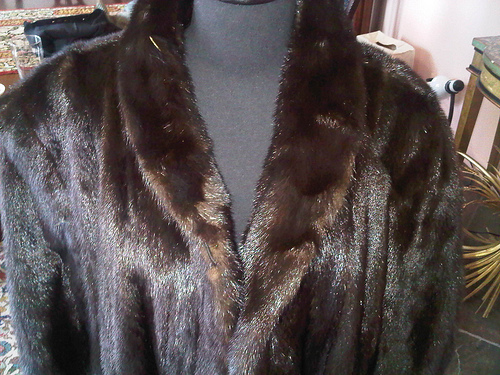 Since mink coats need to be handled with proper care, a mink coat will require special dry cleaning. Due to the sensitivity of the coat, special storage may be required as well. During the warmer months, it’s highly advisable you store it at a local farrier. Mink coats must be stored at 50 degrees Fahrenheit and the humidity levels must be around 45 percent. A female mink is often going to have fur that is softer and lighter than a male mink. The average mink coat skin can last more than 20 years, making it one of the most durable skins on the market. Try to find out how much leather was included with the coat. Mink coats that have a lot of leather can often have less fur as well. It is also best to find out where the coat was made. Lower quality coats are made in countries such as China and are not comparable to the quality of mink coats made in countries such as the United States. If you want to ensure that you are purchasing a legitimate fur coat, make sure that you meet with a furrier. These furriers are going to be able to match you with a quality coat that is made from higher-end, real fur. If you plan on spending more than $1,000, it’s best to inspect the coat in person and avoid making the purchase online. Since the real fur is going to be the most expensive, consider going with an artificial fur. From a distance, the coat will look the same; the cost, however, can be up to 80 percent less.